Landowners residing in the South Fork Kings GSA voted in favor of a $9.80 per acre assessment to cover the costs associated with implementing the State’s groundwater law, the Sustainable Groundwater Management Act (SGMA). Following the close of the Proposition 218 public hearing on June 21st, the South Fork Kings GSA Board tabulated and certified the results of the election. The assessment was favored by 74% of received votes. A majority of received votes was needed to pass the assessment; votes were weighted be acreage. The Board approved and set a rate of $9.80/acre for the fiscal year 2018-19. Each year, the Board will set a rate not to exceed the $9.80/acre maximum for the five-year lifespan of the assessment. 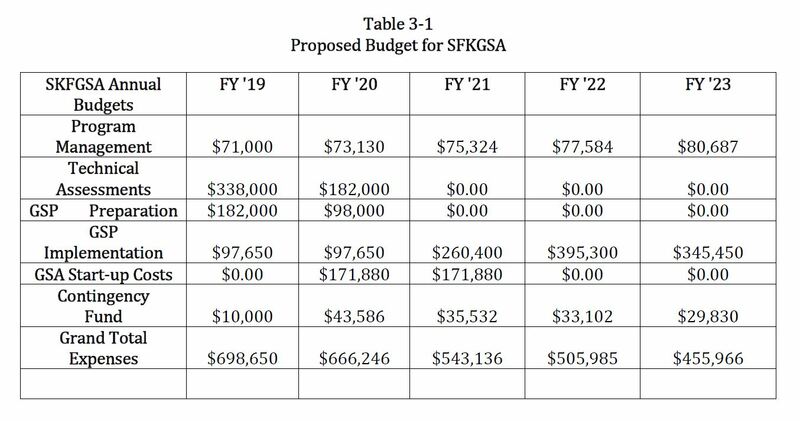 All landowners within the boundaries of the South Fork Kings GSA, excluding those residing in the City of Lemoore, will be assessed the rate via Kings County tax rolls beginning fiscal year 2018-19. The City of Lemoore has entered into a cost sharing agreement on behalf of all property in the City limits and has incorporated ongoing payments into their existing rate structure. The Board is committed to keeping local jurisdiction over groundwater management under SGMA, where landowner dollars are used more efficiently and beneficially. With funding from the election, the GSA is equipped to meet the nearest deadline: completion of a Groundwater Sustainability Plan (GSP) by January 2020. An Engineer’s Report was conducted to set the $9.80/acre assessment rate. The Report calculates the equitable distribution of the benefit derived from each parcel within the agency upon which assessment will be levied. The Engineer’s Report discusses benefits of the Agency’s organization, proposed actions, and services provided by the South Fork Kings Groundwater Sustainability Agency.